Public bicycle sharing: Ranchi’s big move to being a cycle-friendly city! “At the end of the day, I head to a nearby store for vegetables and other items before walking home,” explains Shivani, a native of Ranchi who commutes to work by shared auto rickshaw. Her shuttle isn’t uncommon in a city that’s growing rapidly despite the lack of formalised public transport system. However, she needn’t fret – the city’s ‘go-ahead’ for a public bicycle sharing system (commonly known as PBS system) aims to improve last-mile connectivity. In Jharkhand’s first step toward cycle-friendly streets, Ranchi city has begun construction of its PBS system stations this month. 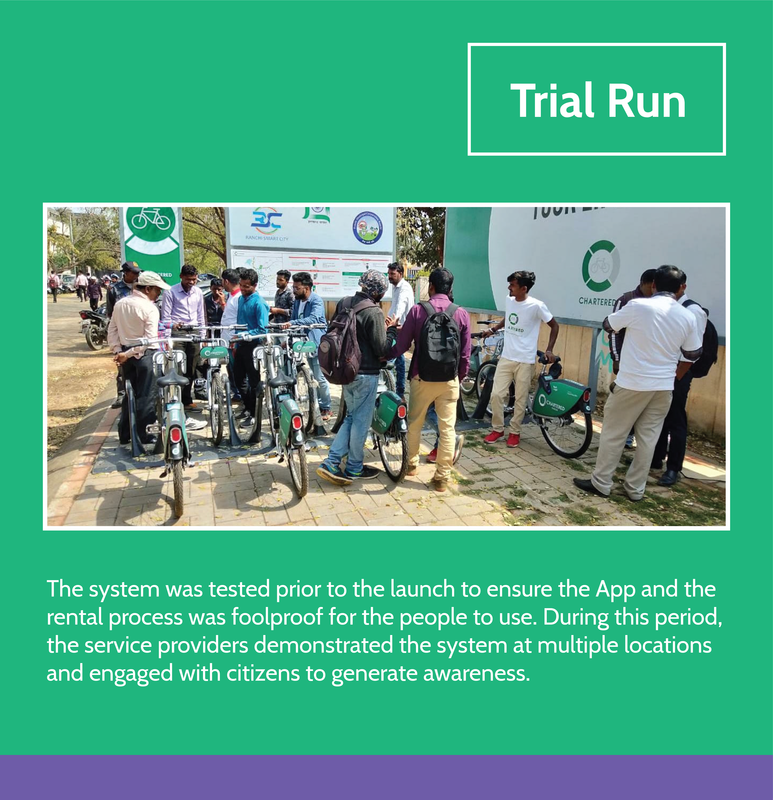 ITDP assisted the State Urban Development Agency (SUDA) in preparing the feasibility of PBS in Ranchi that proposes to see 1200 cycles distributed in the state capital. ITDP also provided technical assistance for the tender document and review of bids in the process. A PBS system is a flexible form of personal public transport. Cycles are stored in a closely spaced network of stations. With a smart card or other form of identification, a user can check out a cycle from a station and return it to any other station. The system offers the convenience of cycling without the burden of ownership, and the flexibility to accommodate one-way trips. With the finalisation of the operator, the system is being implemented in two phases: 600 cycles will be rolled out by May and the remaining 600 by July. The cycle stations provide access to notable public destinations in high-density commercial activity zones like Main Road and Lalpur Road, institutional areas and residential neighbourhoods. The implementation of the system will not only enhance the image of cycling in Ranchi, but also reduce congestion and improve air quality by attracting private vehicle users. Ranchi’s endeavour to reclaim streets for people will bring them a new experience: a city that can be enjoyed on cycles! “I would like to see Transit-oriented development materialize on the ground”, stated C.P.Singh, the Urban Development Minister of Jharkhand, at the public consultation workshop held in July, for the adoption of the Jharkhand Transit-oriented Development Policy (JTODP). The workshop, organized in Ranchi by the Urban Development and Housing Department (UD&HD), thus backed by political will, was an important step towards realizing Jharkhand’s vision of making its cities safe and sustainable. The Jharkhand government has set high goals to this end in the proposed State Transit-oriented Development (TOD) Policy. According to this policy, by 2026, public transport, walking and cycling will become the predominant modes of transport for over 80% of the city trips, thereby reducing usage of personal motor vehicles to less than 20%. Quality public transport will be accessible to a majority of the population within a 400m walk. Further, more than 50% of the residents in larger cities will have access to rapid transit at the same walking distance. Reduced trip lengths have also been aimed at. Once adopted, the policy will guide the future growth of all cities in Jharkhand. By 2031, Jharkhand’s urban population is expected to double to 13.85 million! The 21st century has seen an increase in Jharkhand’s urban population by 32% from 2001 to 2011, totaling at 7.9 million — 67% of which is constituted by 11 cities with a population of 1 lakh and more. Unplanned rapid urban growth in these cities has translated into low-density urban sprawl, longer commutes, increased dependence on personal motorized vehicles, congestion and pollution. This disastrous outcome is a result of conventional car-centric planning and insufficient development of sustainable modes of transport such as walking, cycling and public transport. By 2031, the number of city inhabitants in Jharkhand is expected to further double to 13.85 million! With its cities urbanizing at such quick rates, Jharkhand faces the challenge of planning this transition in ways that will ultimately provide a safe, affordable, sustainable and inclusive environment for its citizens. The state is looking to bring about this paradigm change by adopting a TOD-approach. In contrast to the current method of development, TOD involves actively planning for future mixed use developments — residential, commercial, and other uses — within a compact city form, so that most citizens live, work, and play within walking distance of public transit. Well designed and fully realized TOD areas can play a transformative role in the city’s economic and cultural well-being, creating vibrant and lively places for people of all ages and income groups. Adequate parking fees and overall reduction in parking supply can disincentivize the use of personal motor vehicles. At the consultation workshop held in Ranchi, Ms. Shreya Gadepalli – Regional Director, South Asia, ITDP – presented the key features of the Jharkhand TOD policy. She reinforced the primary principle that streets are meant for people rather than for cars and stressed the need to adopt a transit-first approach to help achieve social inclusion, safety and resource efficiency. The presentation also sought to bust many parking myths and laid emphasis on managing and pricing on-street parking to restrict private vehicle use. The necessary changes to be made to the bye-laws and institutional framework were then elaborated. Following the presentation was a dynamic discussion with the stakeholders — including Principal Secretary and Director of UD&HD along with town planners; Municipal Commissioners of Ranchi; Director, State Urban Development Authority; members of CREDAI and Architects Association of Ranchi. The discussion brought out the likely challenges in implementing the JTOD policy and sought solutions for the same, such as selection of transit corridors for TOD-transformation. Following the presentation was a dynamic discussion with the stakeholders. The consultation workshop witnessed Vision 2026 being received with promising welcome and endorsed by most stakeholders – along with a much needed political backing. It can be expected to soon transform Jharkhand’s urban spaces into people- and environment-friendly pockets, giving way to safe, sustainable and inclusive cities! Ranchi, capital of Jharkand- one of India’s youngest states, is taking incredible strides to transform itself into a livable, healthy, and sustainable city in a very short span of time. With focus on improving the quality of life for its citizens, Ranchi is embracing people-centric planning practices including strengthening public transport services, implementing a progressive parking management system and adopting transit-oriented development principles for urban planning. These efforts were reflected in the city’s Smart City Proposal (SCP), which was selected in the fast-tracked second round of India’s Smart City Mission in May 2016. Originally, Ranchi was not among the first twenty cities to be selected under the Smart City Mission. The proposal, which selected a greenfield development with focus mainly on drinking water, sanitation, sewage and solid waste management, failed to address the challenges of urban mobility posed by Ranchi’s rapidly growing urban population. Until recently, the city’s transport problems were on the back burner. Although half of all the trips in the city are made on foot or cycle, footpaths and cycling lanes are almost non-existent. In the absence of a formal bus service, high polluting and unsafe informal paratransit caters to two thirds of all the motorised trips. Further, the limited financial capacity of the Ranchi Municipal Corporation (RMC) has been a major hindrance in changing the status quo. However, in mid 2015, the city began to take its first steps towards a sustainable transport transformation. RMC assumed responsibility of overseeing city bus operations and is working towards expanding and improving the service. The city has also initiated the process to adopt a progressive parking policy to tackle traffic congestion. To test the policy, the city is working towards implementing priced parking on a heavy traffic commercial zone. The parking prices, which are pegged to parking demand, are approximately four times higher than the current rates. Building on these initial steps, Ranchi’s revised SCP, improved with technical inputs from ITDP, embraced multiple sustainable transport initiatives. Caption:The rendering (above) shows the proposed design of a major intersection, Albert Ekka Chowk (existing photo), on the Main road in Ranchi—with all elements of a complete street. Over the next five years, Ranchi aims to increase its modal share of public transport to 50% by expanding its bus fleet by more than five times—from existing 65 buses to almost 375 buses. An intelligent traffic management system will help improve efficiency and service of its bus fleet. Further, to provide comfortable access to its public transport and encourage walking and cycling in the city, Ranchi aims to redesign 31.5 km of its streets as ‘Complete Streets’ with wide, safe and continuous footpaths, safe crossing facilities, clearly demarcated parking bays, and uniform carriageways. The greenfield area based development is proposed to adopt a transit-oriented development (TOD) approach with dense, mixed-use neighbourhoods planned along frequent, fast, and reliable high capacity mass transport lines. The smart city proposal reinforces the city’s intention to curb private vehicle use by managing parking through market-based pricing. With definite funding from the national and state governments towards these tangible improvements planned in the city, Ranchi is en route to transforming itself into a sustainable and equitable city. ITDP is a proud partner to the city in its mission to embrace this bright future.